Parents will have the opportunity to learn about the primary and elementary Montessori programs, tour classrooms, how to apply and where to get the application form for the primary programs. A completed Montessori application online application portal! If you need assistance with the online application process APS Welcome Center at 2110 Washington Blvd. Suite 100, Arlington, VA 22204 is available from 8:00-3:30 p.m. M-F. You can also reach the Welcome Center by phone at 703-228-8000. The Syphax Education Center is located next to DHS off ART bus routes 45 & 42,“Sequoia DHS/2nd St” stop. All students in the 3 year old year pay a fee for the program. Fees are based on a sliding scale based on the family household income. Students in the 4 year old year whose household income is below $93,760 for the 2019-2020 school year, do not pay a fee for that year. The 5 year old year is considered the kindergarten year. There is no fee for the kindergarten year 2019-2020. 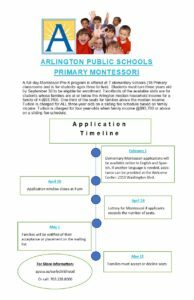 Below is a list of all the Primary Montessori classroom locations in addition to the Montessori Public School of Arlington. 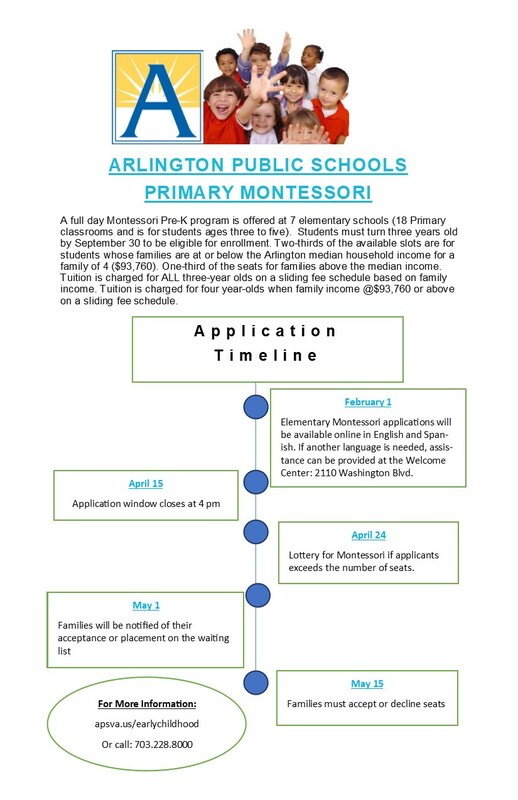 All families can apply to the Montessori Public School of Arlington location regardless of where they live in Arlington. 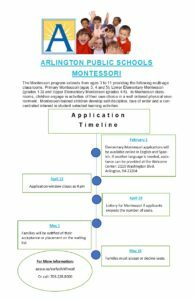 Arlington Public Schools (APS) celebrates 47 years of Montessori education. APS currently has 18 Montessori primary classrooms in seven elementary schools. Gunston offers four Montessori classrooms for middle school students. 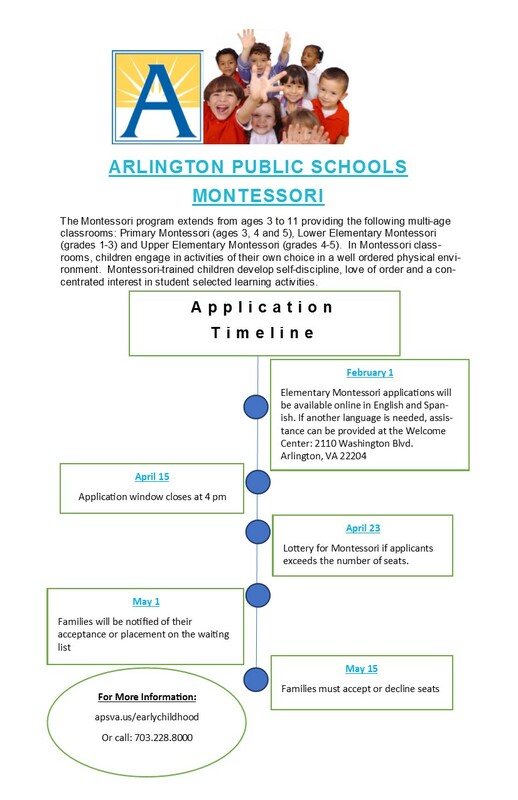 Transportation is only provided to students enrolled in the Primary and Elementary Montessori Programs at the Montessori Public School of Arlington. Montessori education, based on the work of Maria Montessori, is an interdisciplinary, multi-age approach to learning. Students work independently and cooperatively in a prepared environment which allows students to work at their own pace. Montessori teaching materials are designed to promote habits of concentration, initiative, persistence, and discovery, while the Montessori philosophy and community emphasizes respect for others, peace, and creativity.